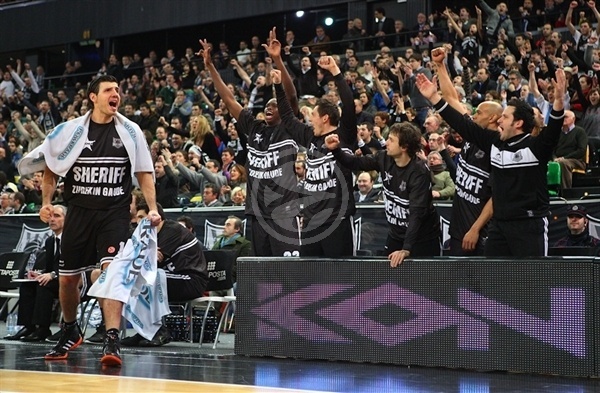 Gescrap BB sent a message that echoed all around the Turkish Airlines Euroleague by downing Real Madrid 93-69 in front of a sellout crowd of over 9,000 fans in Bilbao, Spain on Wednesday. Gescrap and Madrid tie for second place in Top 16 Group F each with a 2-2 record. Gescrap, however, got the tie-break advantage if both teams remain tied at the end of the Top 16. Gescrap will advance to the Top 16 if it beats Montepaschi at home and Unicaja downs Madrid in the Spanish capital. Kostas Vasileadis paced the winners with 19 points. Alex Mumbru added 16, Aaron Jackson had 15, D'or Fischer got 11 while Axel Hervelle got 10 for Gescrap. Jackson added 10 assists for a double-double. 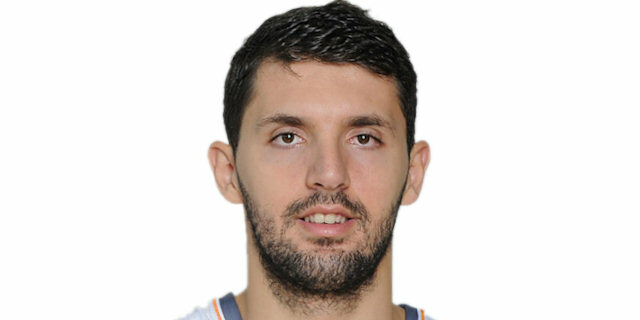 Nikola Mirotic led Madrid with 18 points. 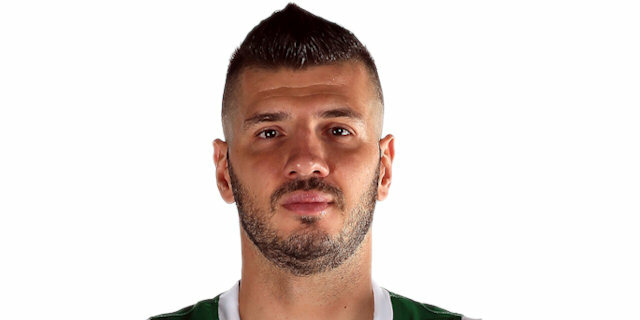 Novica Velickovic added 17 for the guests. Gescrap made 9-of-10 two-pointers and 4-of-4 triples in a near-perfect first quarter in which Vasileadis and Mumbru led the hosts to a 34-14 lead after 10 minutes. An outstanding Vasileadis allowed Gescrap to get a 26-point margin, 52-26, at halftime. Velickovic tried to change things after the break and a three-pointer by Kyle Singler got Madrid within 70-51 late in the third quarter but Jackson, Fischer and Vasileadis stepped up to lead Gescrap to one of the biggest wins in club history. Vasileadis got Gescrap going with a catch-and-shoot three-pointer and a close basket by Hervelle gave his team a 5-0 lead. Madrid went scoreless for more than 2 minutes and an eight-meter bomb by Mumbru set the crowd on fire, 8-0. Jackson dished his third assist to Hervelle, whose fast break layup capped a 10-0 Gescrap run. Mirza Begic scored down low but Mumbru banked in a driving shot and added an easy basket for a 14-3 Gescrap lead. Mirotic followed a bomb from downtown with free throws, as Madrid played to play more aggressive once Gescrap picked up its fifth team foul. Vasileadis buried his second triple and a driving layup by Jackson made Madrid call timeout at 19-8. Jackson kept pacing Gescrap with a layup-plus-foul and Roger Grimau copied him right after that to make it a 17-point game, 25-8. Sergio Llull shined with a floating layup that Fischer erased with foul shots. 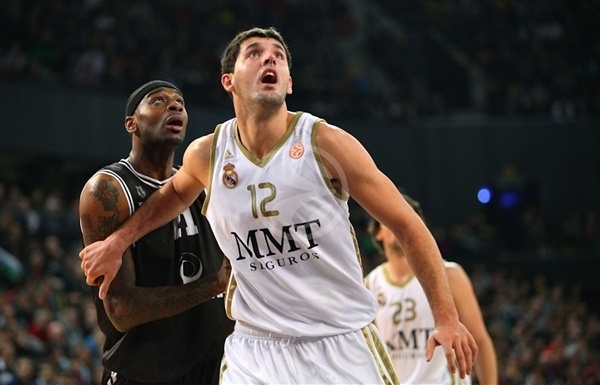 Felipe Reyes and Vasileadis traded layups but free throws by Mirotic got the guests a bit closer, 29-14. A jump hook by Marko Banic and a three-pointer by Raul Lopez made it a 20-point game, 34-14, after 10 minutes. Madrid improved its defense early in the second quarter and Mirotic shined with a tip-in - and the free throw that came with it. Gescrap struggled to score for more than 2 minutes unitl Banic fed Grimau for a backdoor layup. Dimitrios Mavroeidis sent the crowd to their foot with a hard-fought put-back basket, good for a 38-17 Gescrap margin. Kyle Singler stepped up with a reverse layup and Begic scored again but a wild three-point play by Mavroeidis restored a 20-point Gescrap margin, 41-21. Velickovic banked in a close shot but Jackson found Banic for a baseline jumper. Singler shined with a follow-up layup that Fischer erased with a tip-in and Vasileadis and Jackson gave Gescrap a 48-25 margin. Madrid could not find the way to the basket and the hosts kept running the floor through an outstanding Jackson. Vasileadis split free throws and nailed an unbelievable three-pointer that boosted Gescrap's margin to 52-26 as both teams headed back to the locker rooms. Mirotic made free throws immediately after the break and a tip-in by Begic gave Madrid some hope at 52-30. Mumbru stepped up with foul shots and Gescrap entered the foul bonus really early in the third quarter but Vasileadis buried a wild shot from downtown for a 57-30 lead. 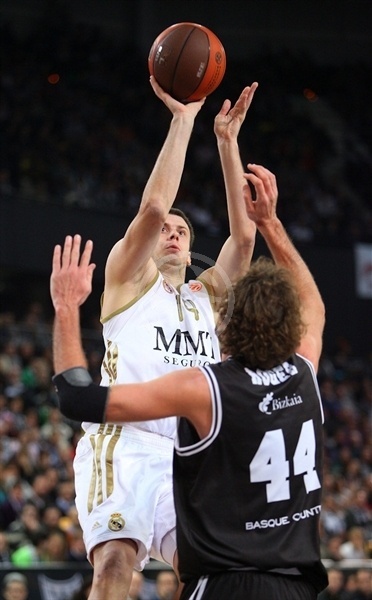 Velickovic sank free throws and followed that with a three-pointer that kept Madrid within 59-35. The game turned into a physical battle, with both teams played really aggressive. Hervelle took over with a dunk that Velickovic matched with a mid-range shot - but he didn't find much help around. Mumbru buried a fadeaway jumper and free throws by Jackson made it a 28-point game, 65-37. Mumbru set the crowd on fire with a rainbow three-pointer but Velickovic answered from downtown for a 68-40 Gescrap edge. Hervelle split free throws but a triple by Sergio Rodriguez got Madrid within 69-43. Velickovic scored again but Madrid kept missing foul shots, as Gescrap had started to use long possessions to run th egame clock down. Velickovic and Singler buried back-to-back triple but a fallaway jumper by Lopez gave Gescrap a 72-51 margin after 30 minutes. The outcome was clear already but Madrid kept fighting for points differential, which may be a decisive issue for both teams at the end of the Top 16. Jaycee Carroll struck from downtown - his first points - but Vasileadis buried a catch-and-shoot three-pointer to restore a 75-54 margin. Carroll kept trying to change things with a put-back basket and a floating layup by Rodriguez got Madrid even closer, 75-58. Fischer stepped up with back-to-back jumpers that forced Madrid to call timeout at 79-58. Carroll buried another triple but Fischer shined again with an alleyoop layup and Jackson hit a one-handed jumper in the lane to keep Gescrap way out of trouble, 83-61. Hervelle and Mirotic traded baskets but a jumper by Jackson made it 87-63 with over 3 minutes to go. Mumbru hit a turnaround jumper in the lane and even when Mirotic and Llull kept trying, everything was said and done already, as all Gescrap fans were celebrating that their team had cruised to a well-deserved, pivotal win. Jackson and Singler, however, were ejected in the final seconds. "It was an awesome game from the first second. We played an amazing first quarter, from our defense. Our game was so good and we played so aggressive. Everyone was so good today, physically and mentally. They couldn’t react even with our mistakes at the third quarter. Beating Real Madrid two times in four days is difficult. 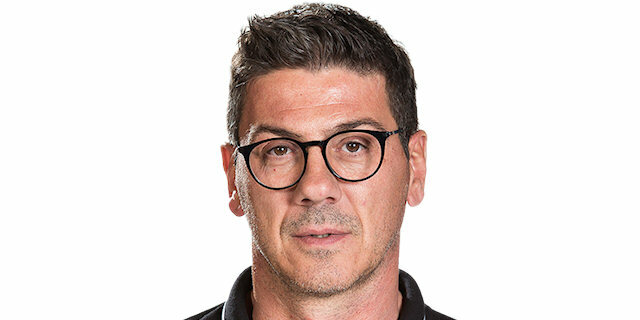 We are going to try our best to win in Malaga and Siena." "The first quarter was the key to the whole game. We allowed Bilbao to play its game and they scored 34 points. We fought for the rest of the game for those 20 points of disadvantage. I want to congratulate Gescrap because they were better than us. It’s difficult for us right now in the group, but we can’t stop fighting; we have to keep on working. We did miss Tomic, but a team like Real Madrid can’t looks for this kind of excuse. " "We took a double step today. We were mentally ready for this game and for this win and we were really focused. We knew we could do it if we were like that and we were able to win the tiebreak too. Now we have to be ready for the next game in Italy, we want to win that game too, we want our revenge." "It was a hard game from the beginning. They were strong from the first minute and the 20-point disadvantage killed us; we couldn’t react. This is a lesson for the future; we have to start the games more strongly. We just want to forget this and get ready for the next games. We still think we can do it and we know we can win in all courts, but we have to work a lot and make things better."